If a picture is worth a thousand words, perhaps a video is worth even more. We have several very short getting started videos on our YouTube channel. These run the gamut from how to get to search builder, to selecting conditions, and using the comparisons, and more. We have all our Search Builder videos in a playlist to make it easy for you. Click here to view the Search Builder playlist. You can save searches that you want to run more than once. You can make searches public by checking the Public box if you want to allow other users to access them. They will not be able to change your search. If they make changes, it will be to a copy of your search. By default, when you save a search it is private, so only you (and the System Admin) can view it. Your list of Saved Searches is displayed on your Home Page in the bottom left corner under My Searches. Click on any search to run it, or click the header My Searches to see all of your saved searches in Search Builder. The Blue Toolbar is available to use with the search results. This allows you to send emails, run reports, export Excel spreadsheets, and more. Search Builder is not limited to staff. 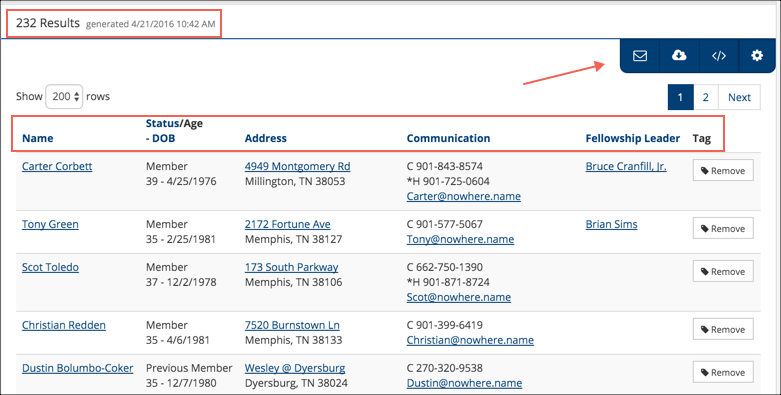 Users who have the role Org Members Only can create and run searches. However, they will be able to view only those people who are in groups that they lead, even though other people meet the conditions of the search. Only users with Finance role can view search results that use any of the many Conditions that relate to contributions. All search results will display the same information, regardless of your search conditions. You use the toolbar to run reports. Building searches incrementally means that you add one condition, run the search, add another condition, and then run the search again. With Auto Refresh, this happens automatically. You will see the results change as you add conditions. This will help you know if you are building it correctly. With complex searches, you will need to think before you start, perhaps even writing out the results that you are trying to achieve. For example: are you looking for people based on their attendance or on their enrollment (you can find people who ‘attend’ an event even if they are not ‘members’ of the organization). Is age a factor? If you are going to email people about an event for adults, add an age condition. Also, if you use Resident Codes in your database, use those to find people in the local area when advertising events that are at your church, and not online. Test your search by looking at a few of the records in your results to ensure that they indeed fit the conditions you expected. The computer will run the search logically, so make sure your thinking is logical. If the results are not looking right, you can work backwards to isolate the problem. You can disable one condition at a time by selecting Disable Condition on the Gear icon menu on that condition. With that condition disabled, you can run the query to see what the results would be without that condition in the query. Be sure to notice the description on each condition, and click the ?Help Article button beside it for more information. This will provide information on how to use that condition. When you access the Saved Searches page, you have several options to determine which searches you see in the list. Example: only your searches, only status flags, etc. If you have not read the basic Search Builder article, you will want to do so. This will help you get started.